LP BACK IN STOCK!!! 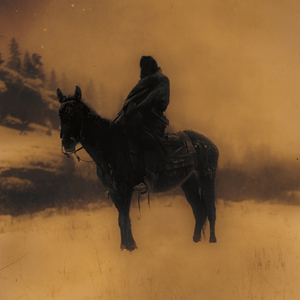 World's Blood is black metal of the American West. Wayfarer recorded the album in the winter of early 2018 at The Thousand Caves in New York under the watchful production of Colin Marston. A reflection of the Rocky Mountains and high plains of their native Colorado, this album tells a story that is uniquely American. Drawing influence as much from the dusty, dark Americana of the "Denver Sound" and the scores of epic westerns as they do the fury and melody of black metal, the band brings something original to the table with a sound that is at once aggressive and honest. The album paints a hallucinatory picture of the western frontier, and the haunting presence of the blood in the soils from a culture lost to time. First brought together in 2012, the members of the band aimed to create something original, in order to contribute back to the pantheon of the great and timeless music that shaped them as people. Releasing their debut album Children Of The Iron Age in 2014, which was later picked up by Prosthetic Records, they would tour alongside the likes of Dreadnought, Falls of Rauros, Anicon, Velnias, and Haunter. Their second album Old Souls was released in 2016 and continued the band's progression to a sound not easily confined by genre tags, more refined and decidedly darker. World?s Blood marks Wayfarer's debut with Profound Lore Records, as they step into their own in the music underground with their strongest and most fully realized vision to date.